“I feel like I’ve finally found myself,” Ell beams about ‘The Project’. “I’m a better guitar player, I’m a better singer, I’m a better songwriter. I’m just a different artist, and I’ve never felt about music the way I do now.” Grooving, diverse, and emotionally charged, it’s easy to hear what Ell means. 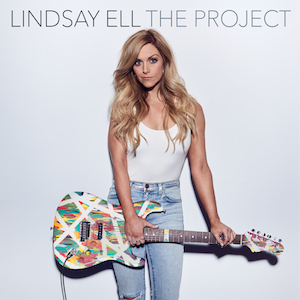 ‘The Project’ reveals every aspect of her abundant talent – from her fiery guitar prowess to her crisp, inviting vocals … and even her new knack for vulnerable song craft. The young singer-songwriter has traveled the world with artists like The Band Perry – including her first visit to the UK in 2013 – and Luke Bryan; showcased her multi-instrumental dexterity as one of CMT’s Next Women of Country; returned to the UK for a headline tour in 2015; and is currently trading guitar solos with superstar Brad Paisley on his Weekend Warrior World Tour. Watch the lyric video for hit single ‘Waiting On You’ here: https://www.vevo.com/watch/lindsay-ell/waiting-on-you-(lyric-video)/QM4TM1701326. A CMT Music Award and Canadian Country Music Award nominee, Ell exhilarated audiences from coast-to-coast as part of the 2016 CMT Next Women of Country Tour and was featured on Brad Paisley’s 2017 Weekend Warrior World Tour. Ell’s debut album ‘The Project’ – named by Billboard as the Best Country Album of 2017 – is out now to stream/download, and gets a UK physical release via BMG/BBR on 9th March 2018, ahead of her performance at London’s C2C Festival. Midland – London Headline Show at Omeara sells out in 15 minutes!